The rain sounds like marching footsteps on my roof. Yes, it is pouring out. So, I thought I’d take the cozy time spent underneath the covers to devote time to my laptop which means sharing another thought that recently crossed my mind concerning Self-Publishing. As always, my thoughts are based on my own experience. Will you get something out of it? It is always my hope that you will. There is always something we can gain from one another. Always something we can add to our Self-Publishing arsenal of sorts. However, while each self-publisher is similar, each is also different. There is no one answer to self-publishing a book. There is no one way that it is done. In this post, JK Rowling is not merely representative of herself, but she is representative of others who have succeeded in the business of book publishing. Thing is, I am not JK Rowling and neither are you. Using Rowling as a platform of discussion, I’ve viewed her countless outlines available online for her books in the Harry Potter series. They are very nice layouts and tend to be very organized but it was also very confusing to me. Rowlings outlines are, again, well organized but it is not something I could have followed. For me, to follow an outline for writing books would just confuse me and I will probably never finish it. It is just not the way that I write. I and me are key terms here. What makes your book special? In a world where people are Self-Publishing books everyday (and often coming out with them at the same time) what makes yours worth the time? Wrote a Historical Novel? So what, so did the next guy. Wrote a Young Adult piece? Who cares, so did she. Her over there. Yes her, she wrote a Fantasy, Horror, Young Adult novel too. In a world where there are seas and seas of Self-Published books, it is not the concept of the story itself that is so different. I believe there are tons of books with similar themes. I also believe that every book has a question that needs to be answered, a message it is trying to deliver, or a problem that it attempts to solve and each author has to answer that question or reveal that message or provide a solution to that problem in his or her own unique way. This, the answer, is what makes him or her stand out. It is the unique combination of that authors own persona as well as his or hers approach that is different and that makes that author either stand out or blend in with the sea. I’m sure authors whose names we all know have been influenced by others, of course. But they have also become known for their individuality. There is always something slightly different about how one author approaches a subject as compared to another. Terry McMillian and Sista Souljah are both talented writers, but Souljah can’t write like Terry and Terry can’t write like Souljah. For each to be successful, each will have to bring something to the table that is different in order to become their own name brands. It is not up to us to write like those who’ve become successful financially and globally. It is up to us to write in a way that works for us, according to our individual personalities and our individual styles. It appears that everyone wants to have the answer to how to Self-Publish a book. The truth? There isn’t one. At the end of the day we have to write stories that people want to read and lets just say the JK Rowlings are already taken. I’d be willing to bet that a book written with less than desirable grammar and poorly promoted can still be read IF it’s an engaging story. Writing is, after all, story telling which is not something everyone can do. This, the skill of writing, tends to be overlooked when it comes to advice or discussion on self-publishing. I’ve seen tons of advice on how to promote, why it is important to get a story edited, why book covers should be appealing, ISBN Numbers, the list goes on and on. I’ve spoken myself about the importance of these factors, why they are important and so on. Except, I do not hear much about the actual skill of writing; the craft of story telling. Poor books is not always because the book cover is bad, the editing is crappy, or that the marketing skills are poor. No. It is because not everyone can write a book. I’ve read Traditionally Published books with tons of grammatical errors and yet people love the stories because they are told well. There is a skill there that draws readers in. Toni Morrison said it best when she said that obviously some aspects of the field can be taught, but you can’t teach skill or talent. I love to sing, but I am not going to walk into someone’s studio and record an album. While I’m sure my voice is decent, singing is not a skill that I have. I would much rather let the Alicia Keys and Whitney Houston’s have at it. As for my voice? Well, that is what showers are for. As for the purpose of this post? Well, we’ve all heard it before: Be yourself, everyone else is taken. This post is so on point! You hit the nail on pretty much everything. Everybody wants to write a book and everybody wants the shortcut to it. Yup and yet there isn’t one. There’s hard work, patience and perseverance all while writing a story that is unique and engaging on a personal level. So true. Thank you for sharing this. 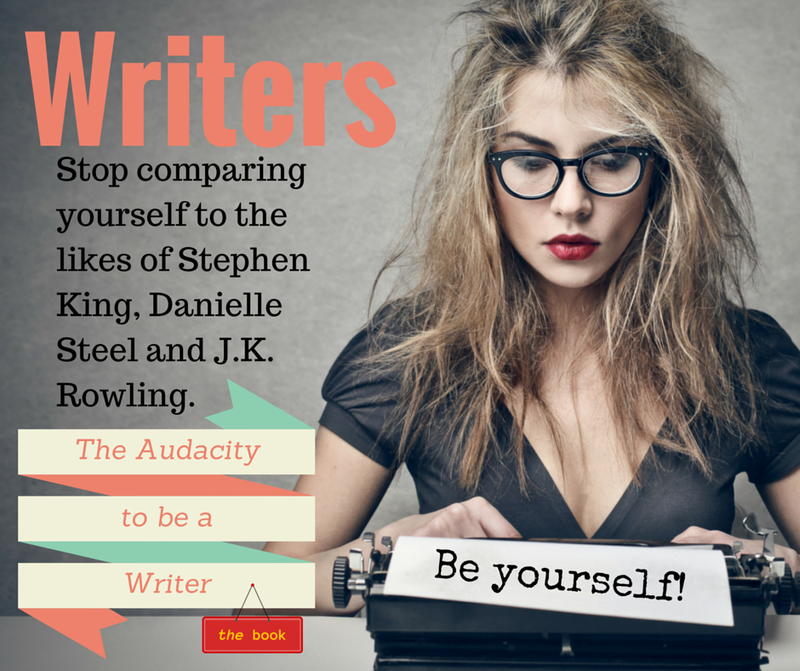 Writers need to understand they are an individual, not a second King, or Rowling. Indeed. Though I don’t want to take away from the learning from others part. It’s just that writers should also know that not doing it King or Rowlings way is still OK.
A thoughtful post about the writing craft. Do readers really care how the sausage is made or do they care more about how it tastes? Lol. Thanks for the reblog. At the end of the day we have to write stories that people want to read and lets just say the JK Rowlings are already taken < brilliant point. We write what we write. There is only one of us. So naturally our story will be unique irrespective of quality. I love these sorts of posts that are very grounding and just realistic. I’m going to let A Tribe Called Quest say it for me: You on point, Y? All the time, Tip. I LOVE the Harry Potter series. But I do not write lke J K Rowling, and neither do I want to. I’m glad she is successful, but I don’t crave her millions. The vast majority of us will not receive such success, and that is perfectly fine. Material gain/wealth should never be the primary motivation for writing. Indeed. Personally, I’m not a fan of the potter books and writing for material gain is a waste of time. My first time visiting after I saw you on another sight. Spot on advice. Thank you Linda and welcome!